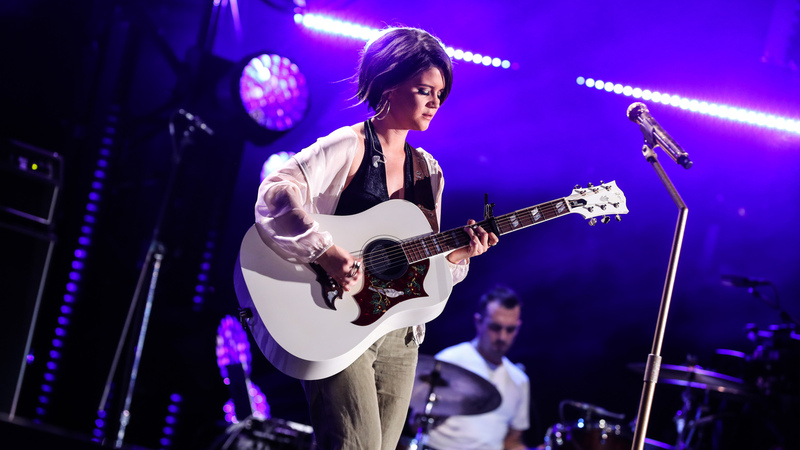 Maren Morris' 'Dear Hate' Offers Heartfelt Response To Las Vegas Shooting Maren Morris' new song with Vince Gill was written in 2015 after the mass shooting in Charleston. The country singer releases it now to benefit the victims of violence in Las Vegas. Maren Morris's "Dear Hatred" is an epistolary conversation with hatred itself. Maren Morris has never been one to shy away from tough topics. Working in a genre known for its conservatism, Morris' frank depictions of female sexuality and desire in her music coupled with her vocal disdain for Donald Trump and support of body positivity have made her one of the genre's left-leaning outliers, though that hasn't stopped her from nabbing a CMA Award and a Grammy. It's not so surprising, then, that Morris would be one of the first country artists to react publicly to Sunday's shooting in Las Vegas, which took place during Jason Aldean's performance at the annual Route 91 Harvest Festival and has, as of this writing, claimed the lives of 59 people. Morris, who performed at the festival the night before the shooting, first expressed her grief on Twitter, writing, "I'm in shock over this. Heartbroken for all those lives taken too soon." Shortly after, she tweeted a YouTube link to a new song called "Dear Hate," along with an accompanying note sharing that she recorded the track with Vince Gill and would donate all proceeds to the Community Foundation of Middle Tennessee's Nashville's Music City Cares Fund, which benefits shooting victims and their families. According to an interview with Rolling Stone Country, Morris wrote the emotional song two days after the mass shooting at Emanuel African Methodist Episcopal Church in Charleston, South Carolina in June 2015. The song functions as an epistolary conversation with hatred itself, introducing hate as a figure "on the news today" with the ability to "poison any mind." The chorus pinpoints the Garden of Eden as hate's origin, before Gill's verse traces hate's serpentine journey through Selma, Alabama ("you were smiling from that Selma bridge"), Dallas, Texas ("when that bullet hit and Jackie cried"), and New York City, where it "pulled those towers from the sky." The last chorus flips the script on hate, personifying love as an omnipresent figure capable of "conquer[ing] all." Sonically, the track hews more closely to traditional country than Morris' typical output, trading the poppy reverb of "80s Mercedes" and the smoldering soul of "Once" for simple acoustic guitar and gently soaring cymbals. It also serves as a reminder that Morris has one of the best voices in country music. "Dear Hate" finds itself among other recent country songs grappling with hatred, including Eric Church and Rhiannon Giddens' Mr. Misunderstood collaboration "Kill a Word" and Tim McGraw's Grammy-winning "Humble and Kind." It's an emerging canon of songs that's sure to grow — as the nation finds itself increasingly divided — and one that can serve as a barometer of country's sometimes conflicted social and political inclinations. "Dear Hate," with its careful mention of less polarizing events like 9/11 (as opposed to, say, the killing of Michael Brown), could very well be a progressive gateway drug for more right-leaning listeners. At the least, though, it offers a heartening message for all of us fighting back tears and nausea when watching the news: "Love conquers all."